The 250-square-mile Rim Fire has been burning perilously close to a longstanding experimental forest near Sonora. Losing it would be a setback for forestry and as fate would have it, fire management. 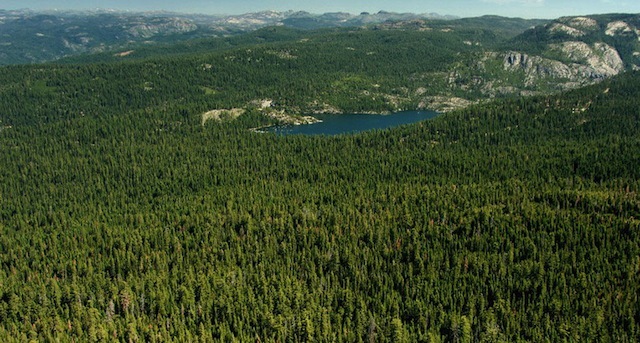 For 80 years, the Stanislaus-Tuolumne Experimental Forest has been a trove of data for foresters. "A lot of what we're doing is trying to understand how forests have changed over time," Eric Knapp told me in an interview at his lab in Redding. Knapp is a research ecologist with the U.S. Forest Service and the "STEF" is sort of "his baby." He says research there has shed light on why forests are burning with more intensity now than before the modern era of logging and fire suppression. These forests looked a lot different then, Knapp told me. Trees were fewer and bigger, and even though they burned more often, they tended to survive fires better than today's woods. "These forests used to have kind of a group-and-gap arrangement, so in a sense they had little mini-fuel breaks within the stands," he explained. The same areas today have about three times as many trees and more fuel on the ground. "A lot of those gaps have filled in with trees, so that when fires burn today, they just burn more intensely. The fuels are more continuous and it really can get a head of steam." Knapp and other foresters are hoping that this fire -- already approaching California's all-time top-10 list in size -- will spare the research site, so the data can keep coming out of it. The work could help foresters fine-tune their management of the land for fire as well as biodiversity. UPDATE: Last word from the Forest Service (8/27) was that the leading edge of the Rim Fire was moving away from STEF, though the American Fire burning to the north appears to have claimed at least part of a UC Berkeley forestry research site, known as the Sierra Nevada Adaptive Management Project (SNAMP). The goal of the research is not to try to recreate what was there, according to Knapp -- not exactly anyway. "Climate has changed, and we don't necessarily want to go back to what it was in a different climate," he explained, but "the structure gives us an idea for a type of structure that was more resilient to fire." By studying the record in tree rings from old conifers, Knapp and his colleagues have concluded that the same stands would burn about every six years, on average, and survive. Knapp says one goal of the experimental forest is to learn how to better manage forests for fire control — if, that is, this fire doesn't claim it. And if it does, Knapp is philosophical about that. "You learn things from that, too."